I had some long-term doubt if the different names kabab,kebab and kabob are dissimilar but recently my doubt was cleared that all are the same! of course googling about this cleared my hesitancy.Next to chaat, kababs too take an integral part in street foods history.The very same paneer ke kabab which is more of tikka style when done in a traditional tandoori oven gives a charcoal y flavour. Iam hard-line fan for this smoky flavour but in our homes we can use a griller or an oven to make it. The vegetable you are using should be cut of same size for even cooking and grilling!mostly for grilling kebabs they are cut into cubes.The onions are separated into segments as cubes and for capsicum the very same way.Marinating the vegetables for some time leaves the kebab to taste awesome!You can very well fry some kasuri methi and crush them before adding it to the marinate for great flavour enhancement.As I had only green coloured capsicum in hand I have used it you can very well use yellow and red capsicum for attractive colour combinations.I have an electrical griller so I did with it if you don’t have one use a simple dosa pan drizzle some oil and cook on all the sides with constant turning when cooked. 1.Soak wooden skewers in water for 20 minutes. 2.Cut veggies as said(ingredients section). 3.Now keep every ingredient ready. 4.Take drained curd in a vessel in-between dry fry the gram flour. 5.Add all the ingredients to the curd with 1 tablespoon of oil,with-saffron mix well. 6.The mixture should be well enough to coat the veggies. 7.Now add vegetables and mix the paneer. 8.Mix thoroughly and leave to marinate for 10-15 minutes. 9.Then insert the vegetables into the skewers. 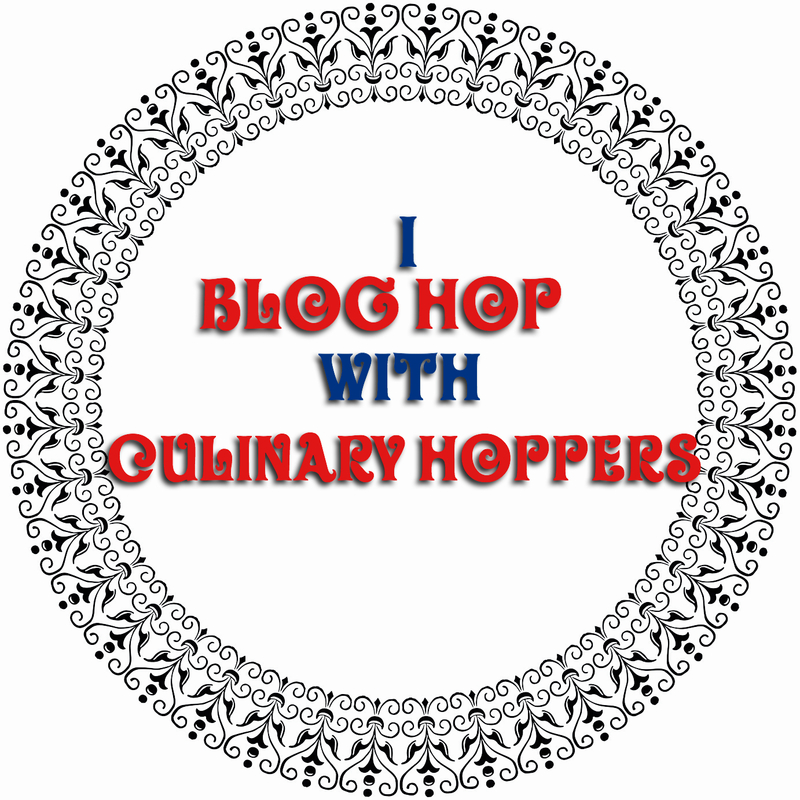 10.First onion,paneer and then capsicum follow this order or arrange as you wish. 11.Heat an electric griller and cook on all the sides till it changes colour. 12.Baste oil then and there and turn the satay sticks till all sides are cooked..
Soak wooden skewers in water for 20 minutes. Cut veggies as said(ingredients section). Now keep every ingredient ready. Take drained curd in a vessel in-between dry fry the gram flour. Add all the ingredients to the curd with 1 tablespoon of oil,with-saffron mix well. The mixture should be well enough to coat the veggies. Now add vegetables and mix the paneer. Mix thoroughly and leave to marinate for 10-15 minutes. Then insert the vegetables into the skewers. First onion,paneer and then capsicum follow this order or arrange as you wish. Heat an electric griller and cook on all the sides till it changes colour. Baste oil then and there and turn the satay sticks till all sides are cooked.. While adding lemon juice be cautious not to add more as we have added curd too it will become tangy. If you like thin coating of batter make it thin so that it coats the mixture lightly. Serve hot with desired chutney. While adding kasuri methi crush and add for more flavour. I have an electrical griller and so I have done with it. If you prefer it to do in oven then preheat the oven and then cook for few minutes in grill mode. Looks delicious very nice party idea. Delicious Kebabs Vani.. i am drooling .. YUMMY!!! The paneer kababs look delicious & gorgeous dear. I am drooling at your exceptional pictures. The combination of yogurt and kasuri methi are a favourite and I can almost get a whiff of the delectable aroma coming from your kababs. Simply too good sweetie. These kababs are bursting out the delicious flavors. Awesome! wow! 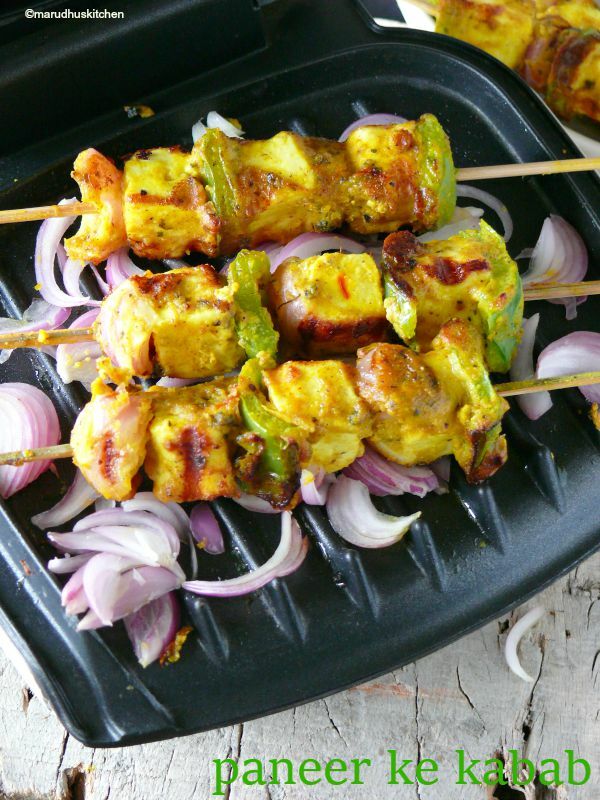 The paneer kebabs are drool worthy indeed such lovely spicing.pictures are superb. Loving the thought of using the grill itself in the picture and the bed of sliced onions. Too good Vani. Nargisi Kababs | LET'S COOK HEALTHY TONIGHT! 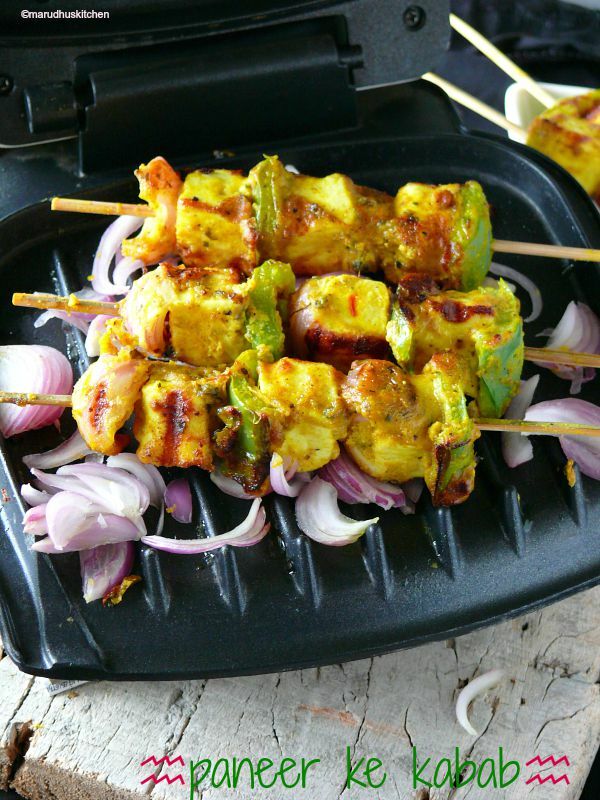 Simply loved these Paneer kababs…Look a those colors..i am drooling..Yumm Yumm! Wow!! Yummy kababs!! Want it now!! Looks so tempting!! Mouth watering kebabs ! Very tempting. Thank you for the tip for carefully adding lemon juice to it as it already has curd.